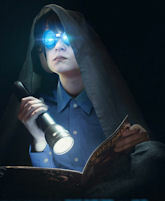 Review: Midnight Special / It's Just Movies Review: "Midnight Special"
Michael Shannon does the heavy lifting in Jeff Nichols’ sci-fi yarn of Alton (Jaeden Lieberher), a child with peculiar abilities. Nominated for the Golden Bear at the Berlin Film Festival, Nichols is racking up an enviable record of awards with only his first four films. The smartest thing Nichols does in making this film a winner is to keep the screenplay simple. The kid has supernatural powers and nobody knows why. There is a mysterious date, time and location that appears to be at the center of it all. That date and time is about three days from the start of the film, giving Nichols a workable time frame to show escapes, captures and the extensive ending in which all is revealed. The violence of the adults in the movie, shooting law enforcement officers and each other, is contrasted with the peace of mind of the saint-like Alton, who spends most of the movie beaming like the Beach Boys guru. The roar of the first escape vehicle, a ‘60s era muscle car, blends nicely with the percussive piano opening. One would imagine the Isuzu’s showing up in the film later are there more as a result of product placement negotiations than deep plot significance. The nice techno-nerd twist in the screenplay is that Alton seems to be babbling a lot of nonsense that turns out to be super-secret US military code. Only NSA agent Sevier (Adam Driver) figures out the exact place and time of the final rendezvous, and only after Alton has mysteriously downed a military satellite used to detect nuclear bomb blasts. The significance of the satellite, and the method by which Sevier figured out the coordinates, are not explained. They just happen, and we know the kid at the bottom of it all must be something else. 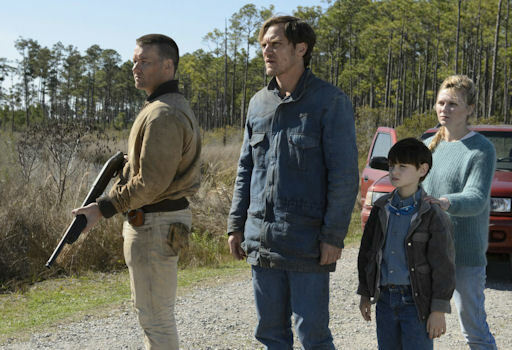 Joel Edgerton does a good job playing tough guy Lucas, Roy’s (Shannon) childhood friend, who abandons his job with the state patrol to shoot whoever he has to in order the get the boy to his meeting with fate. Those who watched Shannon in his lead supporting role in all five seasons of the spectacular “Boardwalk Empire” will like him playing Alton’s dad. Unfortunately, his acting is the same as it was throughout the entire Boardwalk series. He broods. He broods when he walks, he broods when he talks. He even seems to be brooding during the several moments when he is happy, although those moments are few and far between. Kirsten Dunst plays Alton’s mother Sarah who is goodness and light on earth, second only to Alton himself. Between the two of them, they beam enough to light New York City. A poor man’s E.T.? A little bit cheesy? A lot of flabby techno-twists without much foundation? You bet. But what is the fun of the sinful enjoyment of a good old fashioned sci-fi flick without a little tackiness? Be there or be earthbound.